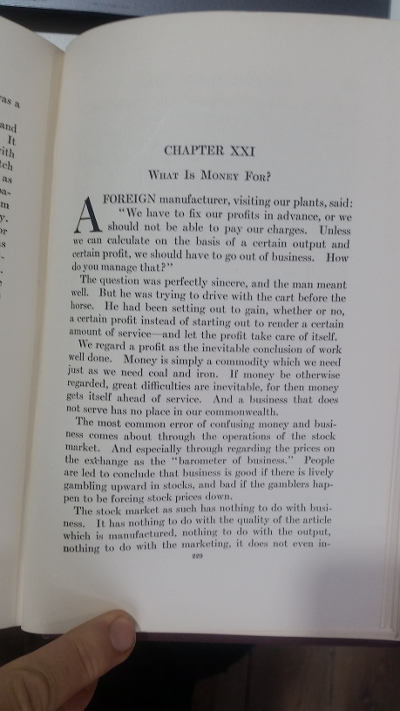 This comes from three pages at the start of Chapter 21 “What Is Money For?” from the 1926 book Today and Tomorrow by Henry Ford and Samuel Crowther. I have photographed and transcribed it, and have nothing better to add to what he said, except to observe that not one thing has changed in a hundred years, and that you don’t find business experts talking like this in modern times — probably due to the long-term re-education process by the finance industry and their deep conflicts of interest combined with a total lack of intellect. The most common error of confusing money and business comes about through the operations of the stock market. And especially through regarding the prices on the exchange as the “barometer of business.” People are led to conclude that business is good if there is a lively gambling upward in stocks, and bad if the gamblers happen to be forcing stock prices down. The stock market as such has nothing to do with business. It has nothing to do with quality of the article which is manufactured, nothing to do with the output, nothing to do with the marketing, it does not even increase or decrease the amount of capital used in the business. It is just a little show on the side. It has very little to do with dividends. A large part of trading in stocks is without reference to dividends. Except with the sober investing class, the dividend is of little consequence; at least, it is not the main objective. Some of the most “active” stocks do not pay dividends. 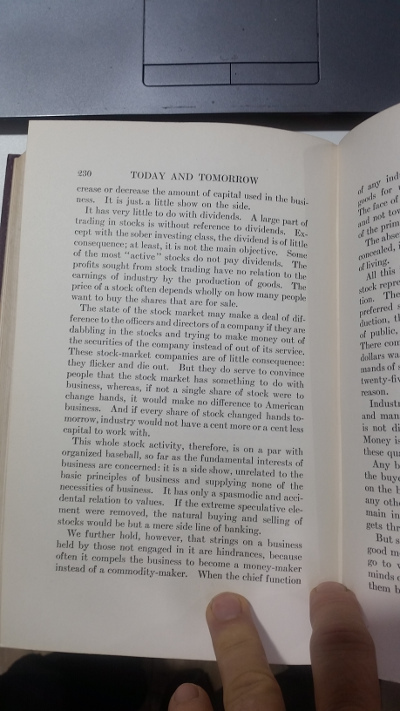 The profits sought from stock trading have no relation to the earnings of industry by the production of goods. The price of a stock often depends wholly on how many people want to buy the shares that are for sale. The state of the stock market may make a deal of difference to the officers and directors of a company if they are dabbling in the stocks and trying to make money out of the securities of the company instead of out of its service. These stock-market companies are of little consequence: they flicker and die out. But they do serve to convince people that the stock market has something to do with business, whereas, if not a single share of stock changed hands, it would make no difference to American business. And if every share of stock changed hands tomorrow, industry would not have a cent more or a cent less capital to work with. 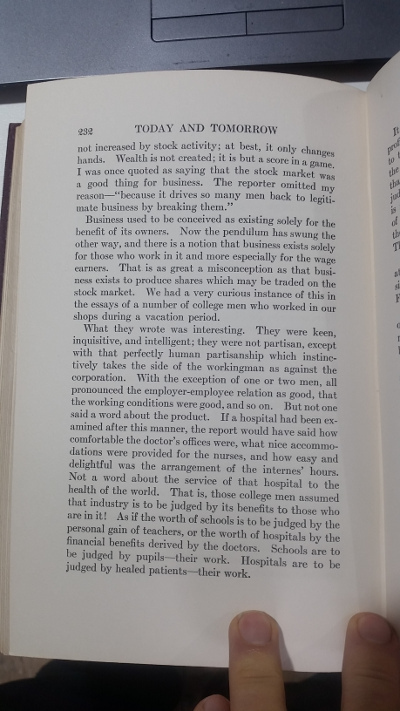 The whole stock activity, therefore, is on par with organized baseball, so far as the fundamental interests of business are concerned: it is a side show, unrelated to the basic principles of business and supplying none of the necessities of business. It has only a spasmodic and accidental relation to values. If the extreme speculative element were removed, the natural buying and selling of stocks would be but a mere side line of banking. We further hold, however, that strings on a business held by those not engaged in it are hindrances, because often it compels the business to become a money-maker instead of a commodity-maker. When the chief function of any industry is to produce dividends rather than goods for use, the emphasis is fundamentally wrong. The face of the business is bowed toward the stockholder and not toward the consumer, and this means the denial of the primary purpose of industry. The absentee stockholder is one of the principal, though concealed, items in the unnecessary and preventable costs of living. All this is defended, of course, by the statement that stock represents a contribution to enable industry to function. The story, however, is not so simply told. 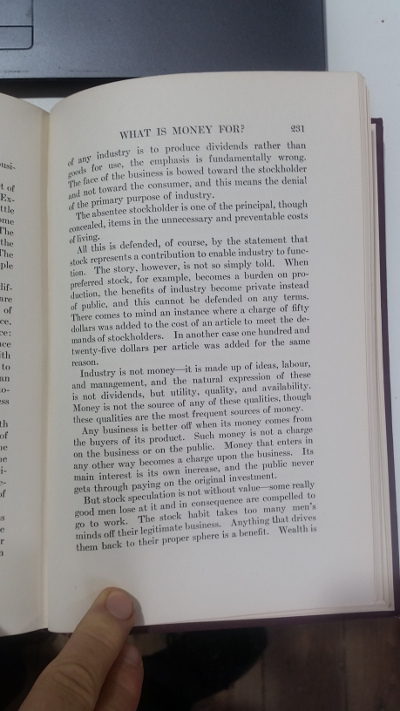 When preferred stock, for example, becomes a burden on production, the benefits of industry become private instead of public, and this cannot be defended on any terms. There comes to mind an instance where a charge of fifty dollars was added to the cost of an article to meet the demands of stockholders. In another case one hundred and twenty-five dollars per article was added for the same reason. Industry is not money — it is made up of ideas, labour, and management, and the natural expression of these is not dividends, but utility, quality, and availability. Money is not the source of any of these qualities, though these qualities are the most frequent sources of money. Any business is better off when its money comes from the buyers of its product. Such money is not a charge on the business or on the public. Money that enters in any other way becomes a charge on the business. Its main interest is its own increase, and the public never gets through paying on the original investment.